Pub in Stoke Newington, with intact Truman's tiling. Formerly called the Lion and the Stoke Tup, and before that it was a trendy place called the Magpie and Stump with sawdust on the floor. 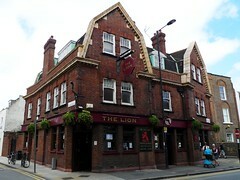 It has now reverted to its original name, the Red Lion. It has a small garden. Last visited by [dhyandeva]?, October or November 2007. Last edited 2016-04-02 08:46:52 (version 17; diff). List all versions. Page last edited 2016-04-02 08:46:52 (version 17).